Last week, I traveled to East Lansing, Michigan, to attend the HuMetrics Workshop at Michigan State University. The workshop brought together a wide range of academics to discuss the values of the humanities and how we might work collectively towards ensuring that our institutions evaluate our work in accordance with those values. As an opening ice-breaker activity, the workshop organizers asked the attendees, who were seated around round tables, to reflect upon and discuss the scholarly activities we had participated in during our careers that had most effectively demonstrated the values we found important in the academy. We wrote down our answers, shared them, and then returned to the larger group, introducing one of our tablemates to the rest of the attendees by describing the experiences and values they found meaningful. At my table, I thought about the experiences that had meant the most to me and named two moments: my work as a co-editor of Debates in the Digital Humanities and my role in creating and directing the CUNY Academic Commons. About the latter, I noted that the Commons demonstrated the values of community and collaboration, especially in a system as large and diverse as the City University of New York. In speaking about the Commons, I had in mind not just our many academic groups, but also CUNY Pie. For me and many others, this group — which brings together pizza-lovers across the CUNY system to sample slices across the city — has always evoked the powerful potential of a project like the Commons. 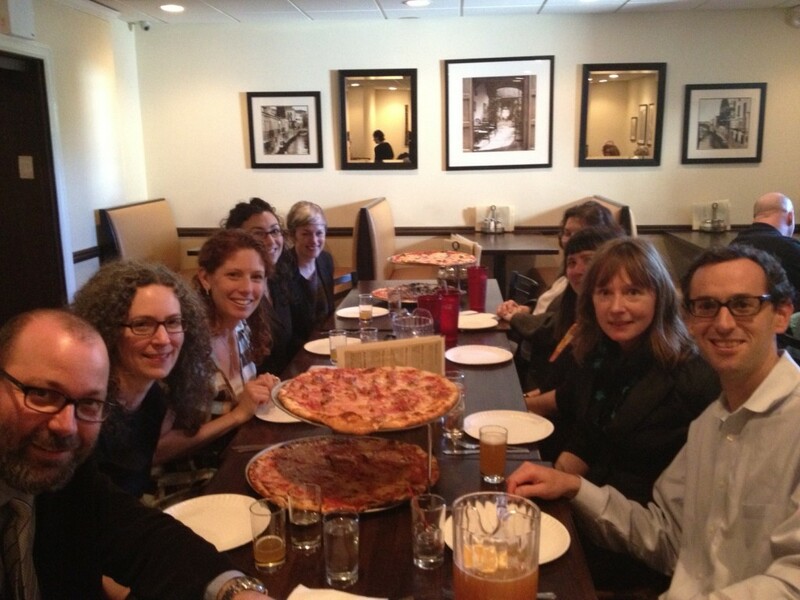 On the Commons, we don’t just share conference CFPs and discuss academic topics — we also get together, IRL, to chow down on some of the best pizza in the world. And in doing so, we instantiate a community that is tied together by more than a shared commitment to values like openness, collaboration, and access; we come together because we live in a city with amazing pizza, and we want to eat it. Together. On the week following Yom Kippur, he suggested, I could do worse than atone for the pizza shade I had so insensitively thrown. Meanwhile, it turned out that my brother-in-law’s niece from France, Noemi, was spending a semester at Michigan State as an exchange student and wanted to get together to catch up. I had one free hour for lunch in the midst of a busy conference schedule. 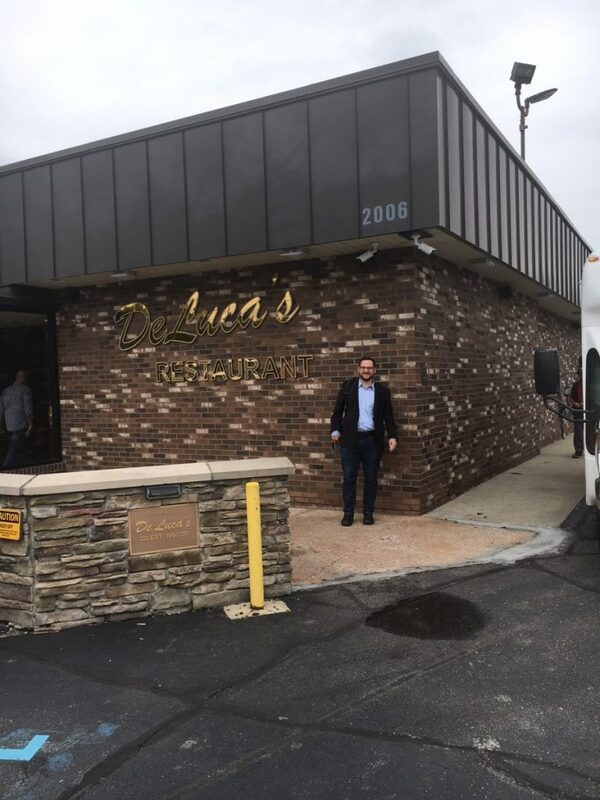 And so it was that I found myself in a cab, heading over to DeLuca’s Pizza in Lansing in early October for a midday lunch. And so it is that I introduce my friend Luke Waltzer to you by way of his home pie. I was struck by the unpretentiousness and solidity of the place: it had the feel of a longstanding, no-frills family restaurant that had served deeply satisfying food for a long time. At lunch, the clientele included some businesspeople out for a quick bite, but it was dominated by groups of elderly people out for a neighborhood meal. The place was clearly an institution; even the tablemat evoked decades of enjoyment. 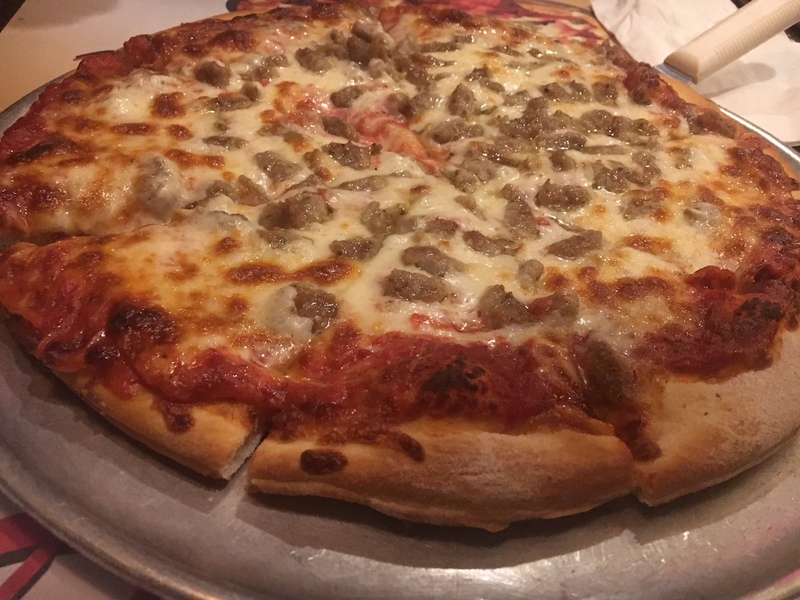 I wish I had had more time to try a range of pizzas, but the conference schedule called and so Noemi and I ordered a single 12″ round pie with sausage. The order went into the kitchen, giving Noemi and I time to discuss her experience as an MSU student — she was having a great time — and her trips around the U.S. I remembered that I had first met her when she was six and I was a graduate student visiting France for the first time. She had gone biking with my brother-in-law around the Normandy countryside; she fell and skinned her knee, and I remembered her tears and her anger at my brother-in-law, who had ridden on ahead of her. 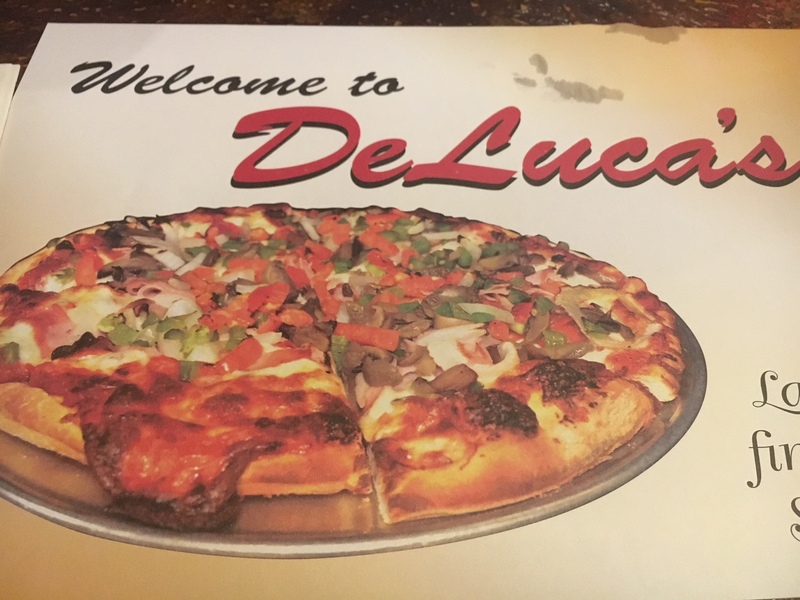 I wasn’t at DeLuca’s with Luke, but somehow it felt right that I was there with someone I remembered as a child. I told Noemi all about the fact that this was my friend’s home pie, the pie he had grown up on. She understood immediately, comparing the experience to Proust’s madeleine. And that was it exactly, though this was someone else’s memory, someone else’s childhood, someone else’s home pie. It was a damn good pie. The pizza was delicious and — to my palate — eminently midwestern, supported by a strong stable crust and a topped with generous helpings of cheese. The sausage was nicely spiced and the pie was gone quickly, save one slice that Noemi brought back for her housemates. She instagrammed the slices for her friends back in France, while I took photos in anticipation of this blog post. I would go back, were I in Lansing again, and I could easily imagine it being my own home pie had I grown up there. This is DeLuca’s Pizza, the home pie of my friend Luke Waltzer. Food is not place, and pizza is not New York City. But for me, the connection between eating in a place and being in a place is heavy with meaning. It’s against this backdrop that the most recent installment of CUNY Pie was conceived. In a few weeks, I’ll be moving to Chicago. So last Friday, a group of CUNY folks, led by my old chums Matt Gold and Luke Waltzer, organized a send-off for me. The theme: a daylong pizza rampage through Brooklyn and Manhattan. These friends know that I have a history not only of eating good food, but of eating large quantities of it, at a large number of places, within short periods of time. In this sense, they couldn’t have chosen a better operating principle for the event. The send-off tapped into more than just my gluttonous sensibilities. It served, in a sense, as a fitting bookend to my life in New York. I came to the city almost thirteen years ago. I’d just graduated college, and had never lived anywhere but in small and medium towns of the Midwest. New York City was a sensory flood. Like so many who come here, I was staggered by the depth and breadth of cultures, the intertwingled histories of the peoples of the metropolis. I struggled to get a foothold. How do you live in New York? How do you find your place, become part of the place? Instinctively, I turned to food. So many of the subcultures that make New York an amazing and ymysterious place are, by that very token, difficult to penetrate. Food, however, is a great equalizer: everybody eats; everybody can formulate their own culinary preferences; anybody can walk into a restaurant and engage in a meaningful way with the culture through the act of eating. It’s only natural, then, that my second or third meal in New York was at Lombardi’s, famously (and allegedly) the first pizzeria in America. The foodways of my youth, which I’d hardly given a thought up to that point – the cheese and the sausage and the sauerkraut and the scalloped potatoes – had prepared me for this kind of engagement. Heck, I used to put away an entire frozen pizza at a sitting. It was perhaps the only foray into the history of the city that I felt qualified to make. In the years that followed, my feelings about New York as Home developed alongside of my knowledge of the city’s food culture. My mental representation of urban geography reflected, in part, my attempts to track down the best pizza. 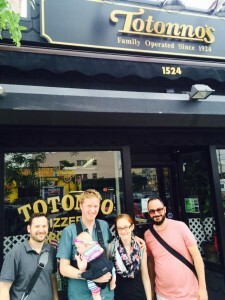 I learned my way around Coney Island and East Harlem and Midwood on trips to Totonno’s, Patsy’s, and Di Fara. I never quite felt at home in a new neighborhood until I’d found the best local slices: the cheap, the late night, the Sicilian, the specialty, the Grandma, the upscale, the plain. Tracing New York’s family tree of pizza places added a dimension to my understanding of city history, of immigration, of race, of gentrification. And adhering to the lingo and customs of slice joints made me feel less like a transplant, or at least, less like an unwelcome one. All this went through my mind last Friday, as we walked past the auto body places on Neptune Avenue to meet Michael Smith, who was waiting for us in front of Totonno’s. I’ve said before that Totonno’s is my favorite restaurant in the city. It’s not just the pizza (though, oh, the pizza!) but also the sense that, despite being one of the most storied pizzerias in the world, it clearly remains a neighborhood joint. Now, on many previous visits, I’ve tucked away an entire pie, or close to it. But the ringleaders warned me that this was just our first stop, so we should pace ourselves. 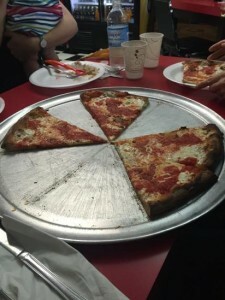 We ordered two pies – a plain and a pepperoni – for the six-and-a-half of us (my wife Rebecca and my baby daughter had made the trip with us, and Maura Smale had just walked in). 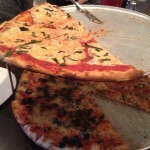 What can I say about the pizza at Totonno’s? For me, it’s the benchmark New York slice. The ingredients are excellent without being ostentatious. 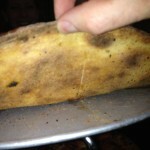 The ancient coal oven blisters the crust with the perfect chew. The basic tomato sauce balances just enough sweetness to dull the bitter char, with just enough acidity to cut through the mellow fresh mozzarella. 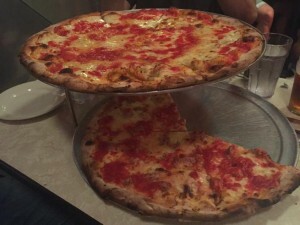 Other classic New York pies are made in a similar style – Grimaldi’s and Juliana’s, in particular, bear a strong family resemblance – but none are executed as consistently, as modestly, in such perfect proportion, as they are at Totonno’s. Three slices (OK, four, plus some crusts) barely whet my appetite. One of the great pleasures of Totonno’s is the post-pizza ride on the Cyclone. This CUNY Pie tradition is a test of the will and of the stomach. So we bade farewell to my wife and daughter and made our way down Surf Avenue. The four middle-aged CUNY men bought their tickets and boarded the rollercoaster. (Maura allowed her better judgment to prevail. She held our bags on terra firma.) I’ve ridden the Cyclone many times, and even in the litheness of my twenties, those ninety seconds jostled my rickety skeleton and my full stomach in a not altogether pleasant manner. But what were the chances I’d get back to Coney Island before the damn thing got condemned? So we went, and I’m glad we did – best Cyclone ride ever. Maybe the knowledge that it’d be my last ride – at least for a while – steeled me against those hairpin turns. 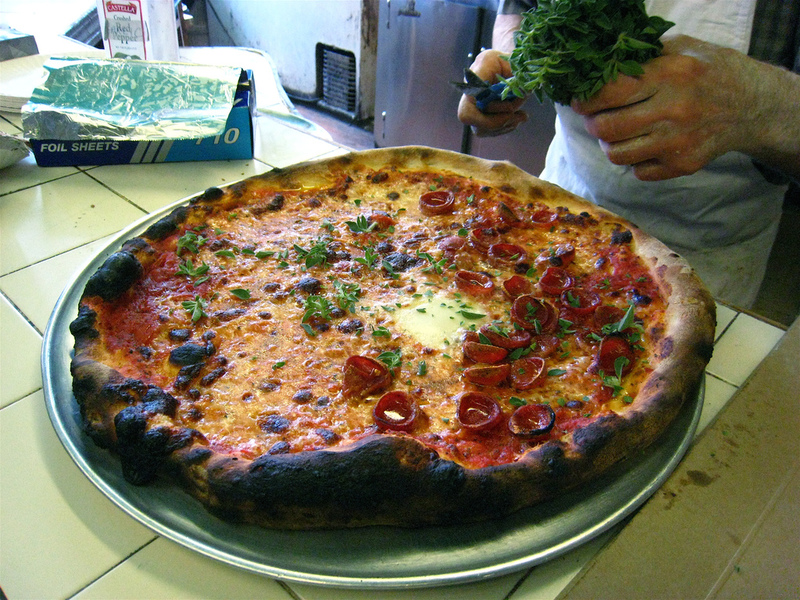 After a stroll on the boardwalk and a bask on the pier, we headed for Avenue J and the next stop on our tour: Di Fara. Descriptions of Di Fara often invoke religious imagery. Partly, this is because the pizza is so good. The extravagance of Di Fara pies is an instructive contrast to the understated nature of Totonno’s. A Di Fara slice is doused with salt and good olive oil and freshly cut basil, in proportions that border on the too-generous. The round pie is excellent, but recognizably in the same league as some of the fancier places in New York. 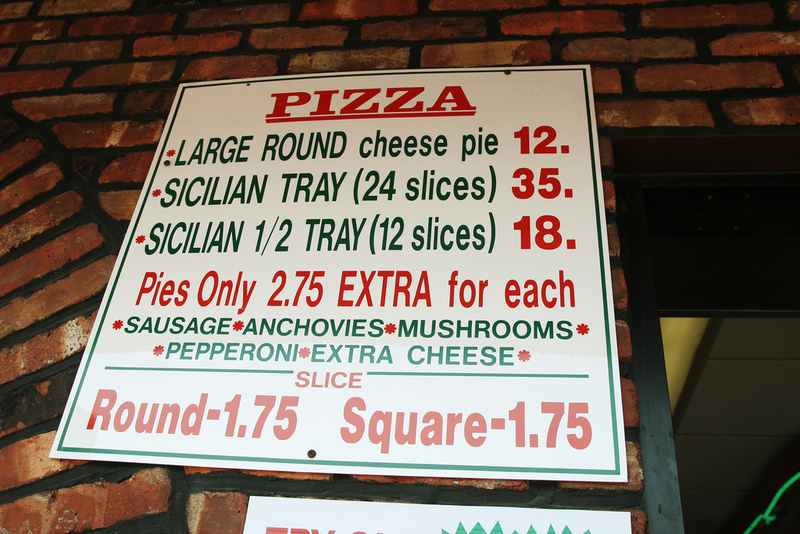 For me, the square pie is where the action is: it’s a Sicilian in form, but so unlike the greasebomb at your corner joint that it forces you to rethink what a square pie can be. The crust is parbaked, and the second trip through the oven lends the corner pieces a texture and color that’s hard to describe. Unlike Totonno’s, I wouldn’t want this to be my neighborhood place – it’s too much to eat, say, once per week – but, in moderation, it can be really trascendant. Beyond the pizza, there’s a lot of mystique around the Di Fara establishment. For decades, the only person who made pizzas there was proprietor Dom DeMarco. Orders were taken somewhat haphazardly, and pies were made with great deliberation. Lines and wait-times had a tendency to swell. The trip to Midwood felt like a pilgrimage; hoping each pizza from the oven would be yours felt like subjugating yourself before God; making eye contact with the pizza maker was like kneeling at the feet of the Maker. 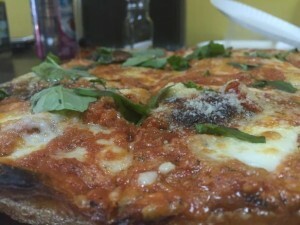 I like the pizza at Di Fara, but I have found trips there to be unpleasant for these reasons. But the gods were smiling on this particular CUNY Pie. We showed up a few minutes before the late-afternoon siesta, when Di Fara locks its doors for an hour. The place was hot but not crowded; right off the bat, we had a place to sit. Dom Sr. was not at the helm, which took something of the romance out of it, but the youngster who made our pies (apparently also named Dom – maybe Dom III?) did a fine job. We had a round and a square between the four of us, which was entirely too much, but it meant leftovers for Michael and Maura, who headed home after this stop. With the exception of the time that I went to Di Fara during a tornado, it was the most pleasant experience I’ve had there. Full but still functional, I hopped the Q with Matt and Luke back to the city. We grabbed a few beers at Wisconsin-themed watering hole Kettle of Fish – as if I needed a reminder that I’m almost Midwestern again – to kill some time before our third stop of the day. At John’s on Bleecker we were joined by Chris Stein and, in his CUNY Pie debut, the Godfather himself, Dr. George Otte. I didn’t feel confident heading into John’s. I like the place: I’ve been there dozens of times; the pies are, at their best, very good; and it’s definitely a go-to in a neighborhood where the alternative options are not great. 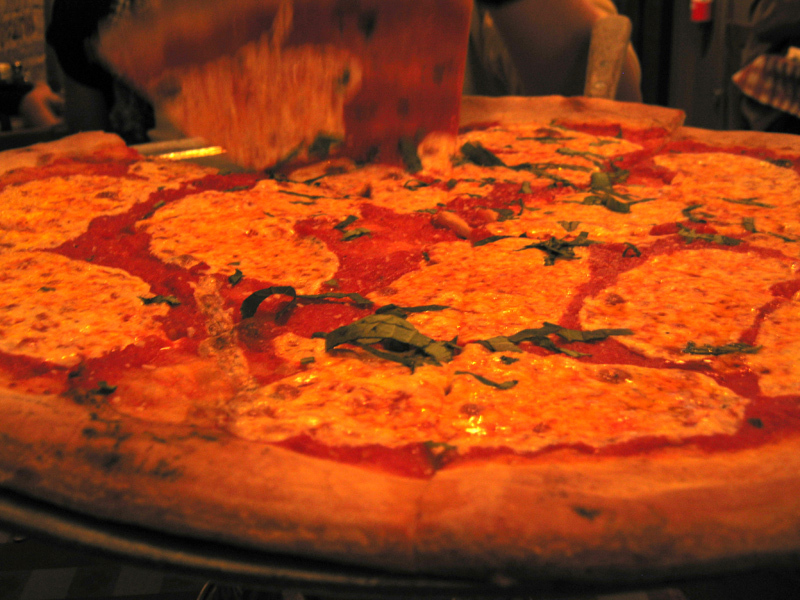 But how would it stand up on a stomach full of Totonno’s and Di Fara – two of the very best pizzerias in New York City? I shouldn’t have worried. Our luck held out, and the pizza was quite good, even after the day we’d had. After John’s, the goal was to hold out for one more late-night slice. So George took his leave, and the four of us remaining soldiered on to a local establishment to bide our time. Chris and Luke, the Jersey contingent, bailed before we had the chance to add a nightcap to our hat trick. It was up to me and Matt to finish what we’d set out to accomplish. That the night should end like this was fitting. Matt and I started CUNY Pie about six years ago, and have since been the stalwarts. It was me and Matt who wrangled various pizza outings for visiting friends, and me and Matt who traipsed through the outer boroughs for those destinations that others found too inconvenient. It’s like the movie says: Die hard with a vengeance. 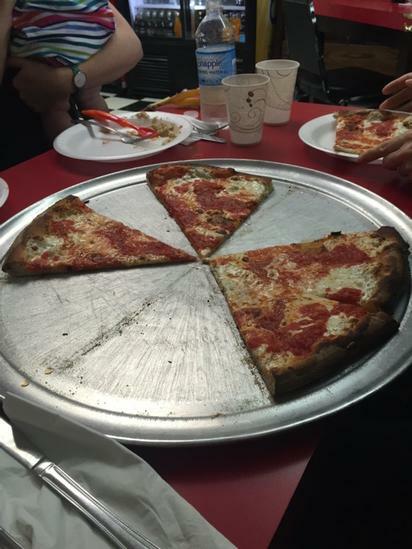 True to form, we wrapped up the night with a slice at Joe’s on Carmine, one of the finest slice joints in NYC. I can’t say I was really in the mood for pizza at this point. But every New Yorker knows the importance, and indeed the wisdom of the late-night slice, and it was a perfect way to wrap things up. I can’t thank my friends enough for organizing a send-off like this for me. The pizza was delicious and the cameraderie delightful. More than that, it was a opportunity to reflect on an understanding of my time in New York. Revisiting favorite and familiar pizza joints, alongside good friends, underscores just how much NYC – and CUNY in particular – really has been my home. If pizza offers a primer for thinking about New York City, then a career in CUNY is a master class. Looking back, one of the beauties of CUNY Pie has always been that the approach to the quintessential New York food through the lens of the quintessential New York institution. What better evidence could there be of a true New Yorker than the ability to navigate the CUNY bureaucracy and the ability to name the best slice in any neighborhood, in one person? It’s been a privilege to be a part of it. CUNY Pie-ers will go out of their way to watch the middle section of Jon Stewart’s Nov. 13th show in which he settles, once and for all, the virtues of NY pizza vs. Chicago Deep Dish. Don’t be eating pizza when you watch it. You’ll choke. CUNYPie returned today after a too-long hiatus with its first trip to Staten Island, where we visited Denino’s. This was a two campus affair, as me and my homeboys from Baruch joined our sisters from City Tech for pies and pitchers, which I’ll get to in a moment. The occasion of our trip to Shaolin was the 8th Annual CUNY Coordinated Undergraduate Education Conference, at which we all presented. There’s lots going on with undergraduate education at CUNY these days, only some of which made it onto the docket at the conference. The controversy around Pathways was a subtext in each of the panels I attended, but was curiously absent in the day’s opening remarks. The general feeling I got from folks was one of resignation that Pathways was probably going to happen, we’ll just wait and see, and then we’ll make the most of it. The keynote was delivered by Mark Taylor, who presents himself as an expert on “Generation NeXt,” and visits schools and other organizations to help them think about improving student engagement. The pedagogy he espouses consists of familiar stuff: flipped classrooms, active/engaged learning, future orientation, embracing technology (though as an information more than a connective tool), etc. The rationale he offers for this pedagogy is grounded in an analysis of generational difference, supported, as far as I can tell, by his synthesis of a range of secondary sources. Not sure if he does original research, as the papers presented on his site refer entirely to the research of others. We heard a good 30-40 minutes of talk about differences between the Baby Boomers and the generation just behind me, drawn significantly from Jean Twenge, whose work I’m not a fan of. Taylor doesn’t come down as hard as Twenge or Mark Bauerlein on “kids these days,” but rather sees in the generation’s broad characteristics learning styles that need to be adjusted to. Taylor’s rationale was pretty Domino’s, which is to say, weak sauce. There was a lot of charm and playfulness and “I’m a southern yokel and you’re all New Yorkers” before he got to what he was trying to say. But you don’t have to be a professional historian to know that identifying the broad differences between generations is only the very beginning step towards understanding how higher education needs to evolve in the coming years. And you don’t have to be a CUNY lifer to know that our university serves a particular set of populations, only small segments of which look like the learners Taylor theorizes about. At one point Taylor argued that colleges and universities better adapt or they’ll face disruption from some unidentified, external force. I don’t necessarily disagree with this notion or find it problematic (except for when he likened students to customers). But many of us know this already, and are determined to be that disruption ourselves rather than simply to head it off. In that spirit, Mikhail and Tom and I left Taylor’s talk fifteen minutes early to go get set for our panel. In short, the keynote was a significant step down from Pedro Noguera’s rousing talk at this same event last year. Noguera knew well who we were and who we serve, and used that knowledge to speak directly to our challenges. But all of this was prelude, prelude to pizza. Denino’s makes a damn good pie, thin but not saggy, with a cornicione that was a bit blistered, chewy, and crispy. We had four pies: a sausage (my fave), a margherita (good, not great), a half olive/half mushrooms (heavy on the olives, and quite strong), and an anchovy (to which I can only say this). The restaurant is a sizable, friendly family joint, and we were very lucky to get a table for ten just before the Friday dinner rush. If I lived on Staten Island, I would definitely be a regular. And it only cost us $13 each! Big ups to Jody Rosen, who grew up on Staten Island, for picking the spot and then bullying me into writing this post. Only you, Jody. Thanks for organizing the outing and giving me that specific kind of CUNY Pie full and happy feeling again. On May 11th, after the CUNY CUE conference (formerly the CUNY Gen Ed conference) ends at 4:30, we’re hoping to have the inaugural Staten Island CUNYPie outing, and I’ve felt the weight of the decision on my shoulders, not knowing other CUNYPie members with Staten Island experience to share in the pizzeria-selection decision. I thought about keeping this message in the discussion board, but then decided that it’s not just a matter of housekeeping–it’s a matter of Staten Island pizza preference, which I take seriously. As someone who grew up on Staten Island, I should be able to say that I’ve tried all the SI pizza all-stars, or at least the ones that were in business when I lived there, or even when returning to visit, but I can’t. I used to go to Goodfella’s on Hylan Boulevard, which was always very tasty, but then they expanded far and wide, and I lost interest. Growing up, when my family wanted good pizza, the kind you go out for, not the kind you pick up and maybe reheat the next day in the toaster oven, we went to John’s Pizzeria in the Village. I don’t think it was until I was in college that my family went to Denino’s, a no-frills top-notch pizzeria on the North Shore in Port Richmond–the best pizza on Staten Island that I knew of. I also remember around the same time going to Jimmy Max in Westerleigh, which also had good pizza, maybe not quite as good, but it was more of a restaurant, which is to say, it had decor and plates that weren’t made of paper. Now when I visit my parents and we want good pizza, we get pizza from Ciro’s in Hugenot–it’s from the same family as Jimmy Max as I understand it, and it’s really delicious. And I noticed that another Jimmy Max opened in Great Kills or Eltingville. I’m glad to know that the South Shore has some good pizza options! But I digress–neither of these would be good choices for the 5/11 post-CUE-conference CUNYPie outing because they’re too far south, the wrong direction from CSI and the ferry or express bus. Just keep them in mind the next time you’re on Staten Island, especially if you’re looking for pizza near the Staten Island Rapid Transit. So, should CUNYPie head to Denino’s? Or to Joe and Pat’s, which I’ve never been to but have always meant to try? There are a few others that get mentioned in one place or another, but both of those write-ups feature Denino’s and Joe and Pat’s prominently, so it seems to come down to these two. There had once been talk about CUNYPie rotating through the boroughs. 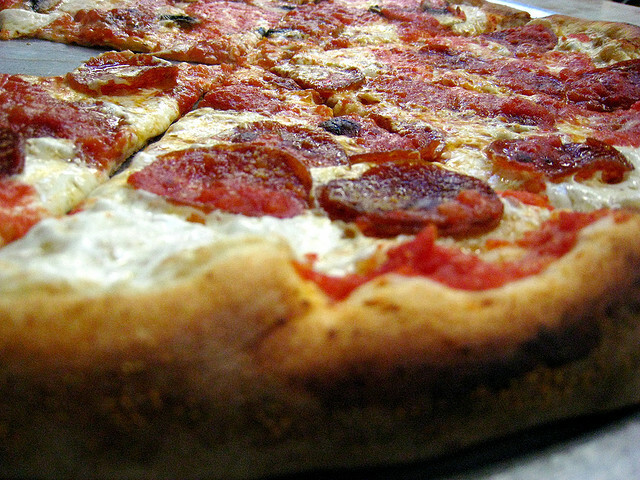 There was also an ambitious goal of eating pizza near each CUNY campus to create a guide of sorts to CUNY pizza-eating. I encourage everyone attending the CUE conference, working at CSI on 5/11, or itching to try some Staten Island fare to join us, and to weigh in here on pizzeria selection! Totonno’s. Tomorrow. DO NOT MISS THIS. This is a biggie. Tomorrow evening, CUNY Pie will make the trek out to the farthest reaches of Brooklyn to sample what many people believe is the best pizza to be found in the New York region (and, therefore, the world (no “arguably” about it) ). So, yes, my friends, you need to join us, as this is sure to be an epic CUNY Pie. Depending on how many people are coming and where they are coming from, we will set up a meeting place so that we can all head over together. If we have a large Manhattan contingent, we can meet there as we have in the past, but I think it might make sense to meet in Brooklyn — perhaps somewhere along the F line. 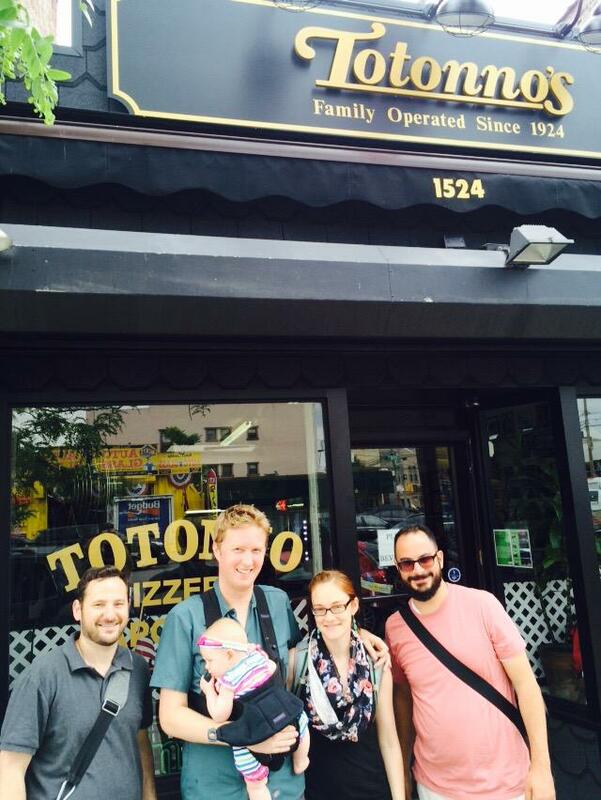 And if you’d prefer to meet us at the restaurant, we will be meeting up at Totonno’s at our usual time — 6pm. If you plan on coming, please respond to this post and let us know where you are coming from. 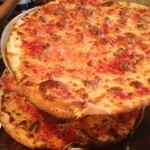 I felt grouchy the day we went to Co., Jim Sullivan’s renowned pizza restaurant on the West Side of Manhattan. In retrospect, I suppose that I was predisposed to be skeptical about Co. I’d heard raves about the Popeye (spinach and gruyère) and the meatball pies, about the oven and the crusts that were coming out of it. Accolades had reached me through Twitter, where friends had loved the place, and through the traditional media, where Frank Bruni had bestowed a coveted star. These kinds of expectations, coupled with a look at the menu – single-serving pies average $15-ish – had put me on alert long before arriving at 9th and 24th. We were a big group, so we ordered at least one of every pizza on the menu. I would call several of the pies “good”. The Margherita was nice enough, the Popeye was indeed tasty, the sausage on the Boscaiola was pretty top-notch. The Rosa, more like pa amb tomàquet than pizza, was the best thing I ate at Co. that day. All the other pizzas were pleasant enough. For being heralded as a pizza-crust-lover’s paradise, I found the pies inconsistent in their doneness; a few had a char that bordered on burn, while others were paler than I would have liked. All of the crusts were puffier, breadier than I’d anticipated, which isn’t necessarily a bad thing when considered as bread, but always strikes me as odd in pizza. And really, this strikes at the heart of my feelings as I ate at Co. Set aside the fact that the meal itself was overpriced and overhyped. Considered qua meal, my lunch at Co. was actually pretty enjoyable. But as someone expecting pizza, the experience left me feeling sad. While it certainly isn’t the worst offender out there, Co. symbolized for me a kind of emotional trick. When you open a restaurant and decide to advertise it as a pizza place (or when you have a very New Yorker “Pies” section on the menu), you bring the entire history and culture of pizza to bear on the dining experience. The diner’s expectations are framed by the pizza terminology, which evokes a family of pizza-related thoughts: red-checkered tablecloths, frozen pizzas, red pepper shakers, Pizza Hut. 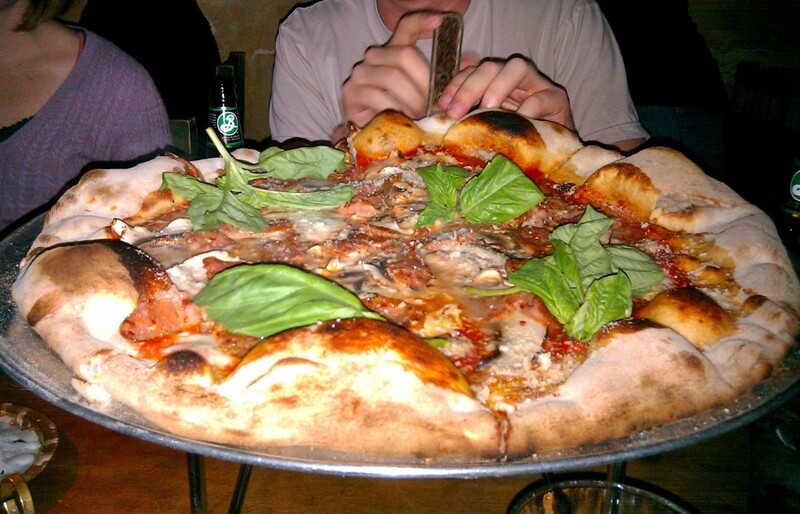 The baggage of “pizza” is especially impossible to avoid in New York City, where American pizza was born. Like no one else, New Yorkers are deeply connected to their corner slice joints and their favorite holes-in-the-wall. The connotations of “pizza” are surely different for everyone, but there are a few common refrains through those connotations: a certain humility that springs from pizza’s origins as a cheap food for and by immigrants, and is carried on in the $1.75 ($2.00? $2.50?) slices that are the mainstay of many a grad student’s diet. If “pizza” evokes the quotidian, then to open a pizza restaurant that is highly unquotidian is to make a statement. Such statements can be a beautiful thing; to reject them altogether is mindlessly conservative. Pizza trends can relate to each other like big band jazz to the blues, like bebop to big bands. But if you’re going to evoke the lineage of pizza in order to flout it, let it be a meaningful artistic statement. 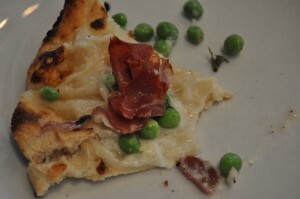 Flatbread with béchamel and lardons is not the the same thing as *pizza* with béchamel and lardons. $16 flatbread is not the same thing as $16 *pizza*. As you multiply the vectors of contrast against the history of pizza, it gets harder and harder to justify the name; without a thoughtful reason for evoking the emotions attached to pizza, you risk exploiting them. I feel a bit exploited whenever I visit a place that flouts my culinary expectations in an apparently thoughtless way. I do wonder, though, whether my reaction is a function of the fact that I think too much about pizza. For those of you who are fans of Co. and its ilk: what do you like about it? How do you place it against your pizza heritage? I recently met with fellow CUNY Pie co-founder Boone Gorges to discuss some Commons-related issues, and, as usual, the subject of pizza came up. We agreed that the group has had a good first year, but we thought about instituting some changes that would up the ante a bit next year. In order to add a bit of regularity to our meetings so that members could plan ahead, we’d like to set up a regular meeting schedule. And we thought that it might be good to embrace a semester-long theme. We left my first suggestion — that Fall 2010 be devoted to the borough of Queens, in part because we didn’t make it there in year one — for a later date and decided instead to go old school for the fall, visiting long-established institutions as a grounding point. This continues the work we began last year, when we visited a few of the legendary New York pizzerias (Lombardi’s, Patsy’s, Totonno’s). It seemed only right to finish the job. Finally, we’re asking that one attendee of each event, to be determined at the table, write up a quick (emphasis on quick) recap for the CUNY Pie blog. Posts should include photos and should be published within two or three days of the visit. We need to make sure that we document our work and that we do so in a timely fashion. So, here is our proposed schedule for the Fall. We will meet on the first Thursday of every month at 6pm, unless otherwise noted. Notice that the November 4th location is TBA; we’d like your help in figuring that one out. Please nominate an old-school NYC pizza joint in the comments. And if you have suggestions for future themes, please let us know. Here’s to more good eating in the next academic year! 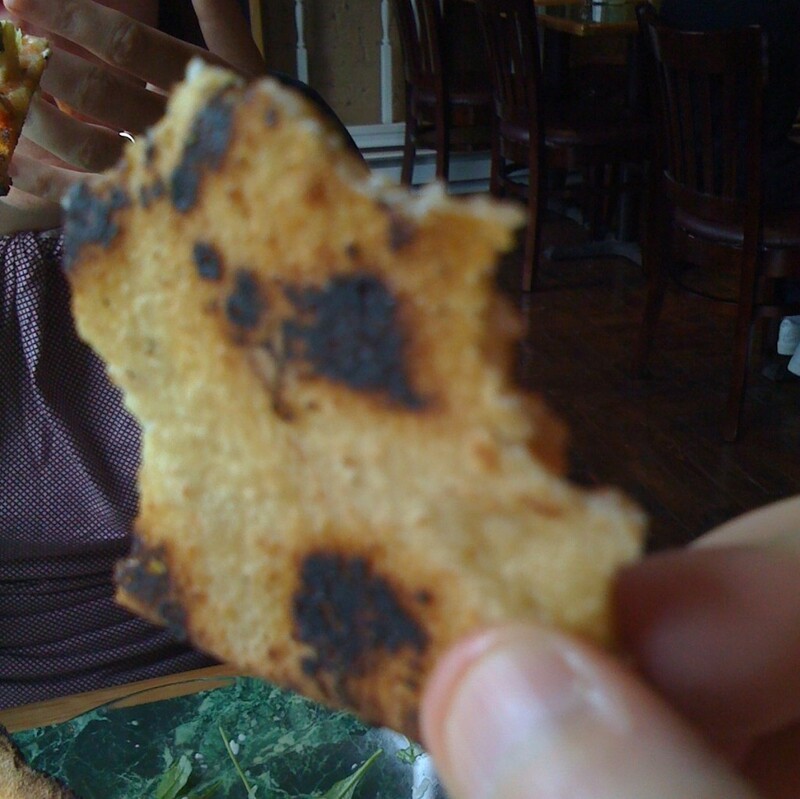 A Platonist at heart, Boone Gorges ruminated upon the ideal crust and proclaimed it to be deeply charred. Boone Gorges considered the role of toppings on pizza and declared that he would like to live in a house built out of Totonno’s pepperoni. Jody Rosen urged us to try Giovannas. 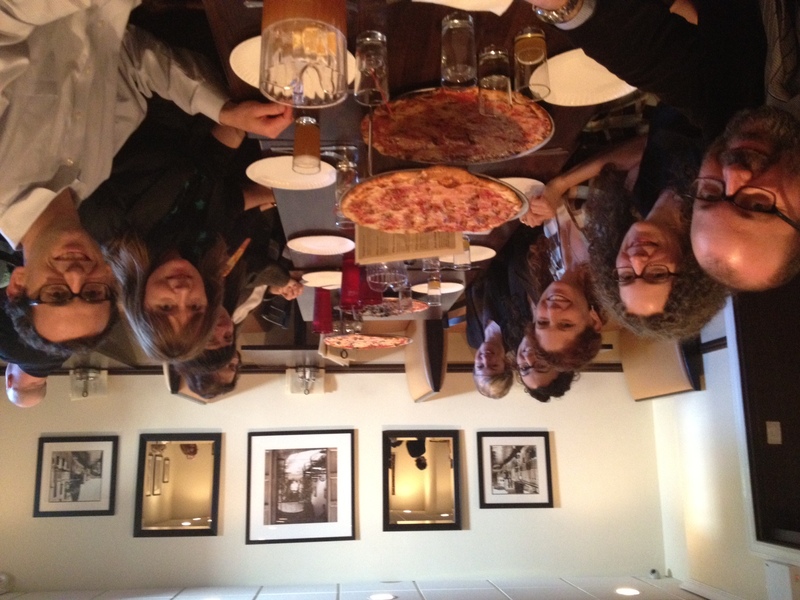 A few members of the CUNY Pie crew sampled pizza in Fairfax, Virginia. All in all, it was a very good first year, though we have miles to go — and many pizzas to eat — before we sleep. More about that in the next post.